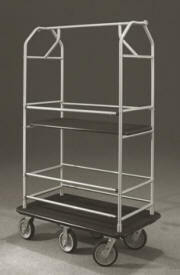 Glaro “Super-Glider” Six Wheel Bellman Carts deliver an unsurpassed level of performance. The unique engineering and design have provided what other hotel luggage carts cannot, a cart that pivots in place on a central axis. Glaro has coined the term “pinpoint maneuverability” to describe this feature. As a result an operator can maintain complete, precise, and safe control with minimum effort. The 40” and 48” carts are designed to be pushed and pulled from either side. Due to the caster configuration, operating the luggage carts from either end is just as efficient. Engineered and designed for efficiency, these six wheel bellman luggage carts have hi-tech swivel casters mounted in each corner and two rigid casters in the center of the chassis to provide a pivot point. Eight inch diameter non-marking, solid rubber and pneumatic shock absorbing ball bearing casters guarantee a quiet, smooth ride. This high level of accuracy is especially useful when maneuvering in and around elevators, turning corners, and moving through doorways and other tight spaces, while reducing building damage and potential personal injuries. 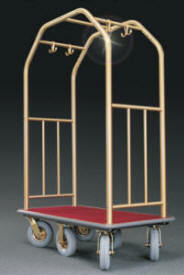 Glaro “Super-Glider” Six Wheel Bellman Carts and Hotel Luggage Carts have been manufactured by hand and then rigorously tested. 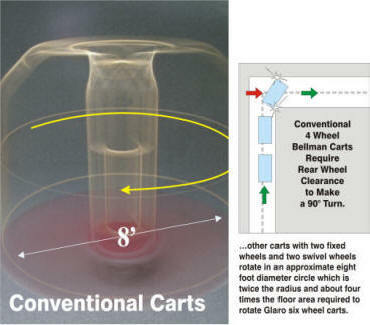 The evaluation process ensures that each bellman cart meets Glaro Inc. quality standards to ensure that each and every cart will perform at a high level for years indoors and out. 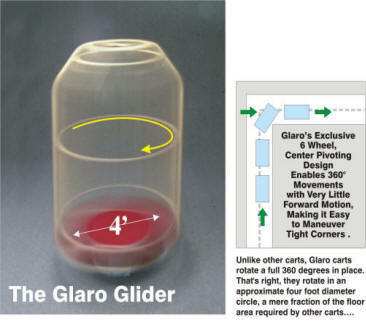 Glaro “Super-Glider” Six Wheel Bellman and Hotel Carts, Value Carts have several carpet and vinyl color choices for the deck covering. The tubular structural sections are available in two metal finishes (satin aluminum and tarnish proof satin brass) and 29 designer powder coat colors. Carpet and finish samples maybe requested. Custom carpet logos are offered for larger orders. Optional removable side containment rails are also available. Black or grey may be selected for casters and bumper colors. 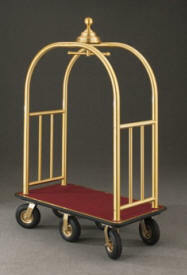 Back to the category page on Bellman Carts and Hotel Luggage Carts.